Scott Mann MP for North Cornwall is campaigning for one of the Royal Navy’s new Type 31e frigates to be named HMS Cornwall. Announced as part of the Government’s National Shipbuilding Strategy, an initial batch of five Type 31e general purpose frigates will be built, with the first coming into service in 2023. A competition for the design of the frigate will open in Autumn 2017.
to complete and submit the sign-up form. A petition will then be presented to the Ministry of Defence. 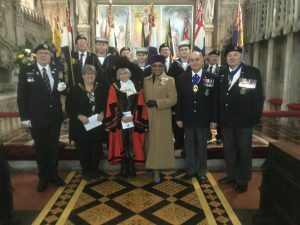 The Bristol Branch Standard was laid up in the Lord Mayors Chapel Shipmates from the Area were joined by the Lord-Lieutenant Mrs Peaches Golding OBE, the Lord Mayor Cllr Mrs Lesley Alexander and Sea Cadets from TS Adventurer. The Lord-Lieutenant passed the Standard to the Lord Mayor for display and safekeeping in the Chapel. After leaving the Chapel, Shipmates, their friends and families retired for a light lunch at the RAF Club in Henleaze. 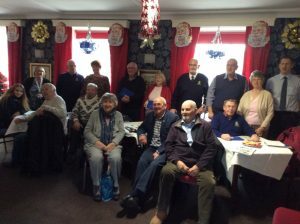 Members of the Chard branch broke with tradition this year when they held a Christmas Buffet at their base in the Chard Rugby Football Club. It was unfortunate that the numbers attending were down for this occasion due to the dreaded coughs, colds and stomach complaints that appear to be doing their rounds in the area, however those attending were entertained by husband and wife team S/mates Chris and Anne Trustcott who held two very thought producing Xmas quizzes whilst seasonal music played in the background. The ‘Girls Ahoy team’ S/mates Sherilyn James and Helen Day played their usual blinder selling raffle tickets with the caller being our chair S/m Malcolm Day. All attending were suitably impressed with the seasonal buffet supplied by a lovely lady on the Rugby club’s catering committee. The evening was rounded off when S/mates Paula Moon and Mags Asprey posed for a photograph in front of the tree wishing all members of the RNA a Merry Christmas and best wishes to all for the New Year. The Pilgrim house in Weymouth’s Hope square was the chosen venue due its great facilities and best deal in the area for such an undertaking. Ten local clients were organised by Shipmate Richard Gray webmaster of the Portland branch. Clients from Dorchester, Christchurch and Portland gathered for a very enthusiastic learning session lasting some two hours on Saturday morning 9th December. Training staff from Plymouth and Hampshire provided the expertise required to encourage the students and develop their iPAD skills. The highlight of the session was to witness Shipmate Steve Skerman speaking to his son in America, whilst seeing him at the same time, on line. The Portland branch are more than happy to provide the facilities again, if required having learned a great deal this time and will do even better next time. 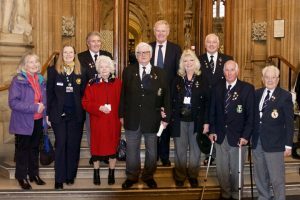 On Monday 27th November 8 Shipmates of Ferndown Branch accepted an invitation to visit and take part in a Tour of Parliament Buildings from their local Member Mr Chris Chope. The visit was an early one which meant that we had to leave Branch Headquarters at 07.00 to be in time for tour to start at 10.45, but they required us be there half an hour before. On a dark and frosty morning we started off, unfortunately the traffic on the M3 was so congested that we arrived at the \House at 10.55. We were lucky in that we had telephoned from the M3 informing them of the situation. We were allowed to start at 11.00. The security is airport style, everything metal, belts coats bags had to be removed. This done we moved into Westminster Hall and introduced to our guide for the day Teresa. Expecting to be told about the Hall, we were taken right to the Queens Entrance, from there we progressed gradually through the building visiting all the spectacular rooms, into the House of Lords Chamber. Into the lobby and on to the Commons Chamber. In both Houses the stewards were setting up for the start of business at 2.30. We arrived finally back into Westminster Hall, where various memorials to various Kings had laid in state, also where various people had stood trial before losing their heads. Back in the Central Lobby we were joined by Christopher Chope. Following which a sojourn to the Café for a welcome cup of coffee/tea/chocolate. Leaving London we made our way to the Ship Inn at Mortlake on the towpath of the River Thames, for a welcome stop for food and drink. Finally arriving back at Branch HQ at 19.30. Commodore Bob Fancy OBE Royal Navy and wife Sarah were Guests of Honour at the Trafalgar Dinner held at the Livermead House Hotel, Torquay. Members listened intently to Bob’s enlightening speech about Vice Admiral Horatio Nelson, his inspirational leadership and his ability to bring out the best in his men. To conclude Bob proposed the toast to ‘The Immortal Memory’ when all members raised their glasses in silence. First class cuisine, attentive Hotel Staff and a very warm ambience created a most enjoyable weekend. Over 25 wreaths were laid which included Town Mayor of Portland Cllr. Charlie Flack. MP for Dorset South Mr Richard Drax MP. The Court Leet. The Royal British Legion. The Royal Naval Association. Army Associations. Royal Air Force Association. SSAFA. Dorset Police. Royal National Mission to Deep Sea Fishermen. National Coastwatch Portland Bill. Portland Sea Cadets T.S Penn. Portland ACF. The Dorset Fire Service H.M. Portland prison. The RAOB and many other organisations and associations. Another event, in the evening this time at the St John the Baptist Church Fortuneswell, for the Royal British Legion Portland Service of Remembrance”. 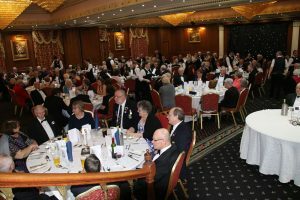 Over 80 honoured guests and Shipmates were mustered for a reception at 1900 and welcomed the top table in our normal generous fashion. Branch President Shipmate Roy Lovell and Chairman Malcolm Day welcomed everyone and set the scene for the evening. Number 4 area Chaplain Geoffrey Walsh offered Nelson’s Grace and a very fine dinner was served. The President of Number 4 area Shipmate David White MBE. MSM, who was accompanied by his wife Monica, gave a very informative after dinner speech. 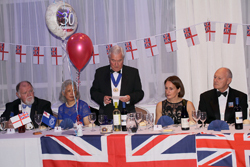 The Loyal Toast was offered by Commodore David Pond, patron of the Chard Branch. There followed presentations, flowers for the Ladies and various gifts to the other guests. Shipmate Dan Sherren, the Portland branch Chairman asked Charles H Thompson BEM to present a 30th anniversary gift of an engraved glass rose bowl from the Portland Branch to the President of Chard Branch. The entertainment, raffles and splicing of the Main brace were highlights of the very well organised evening. Finally, proceedings were brought to a close with the last Waltz, a hymn – The Day Thou Gavest Lord is Over, followed by a Royal Marines Sunset and Pipe Down. 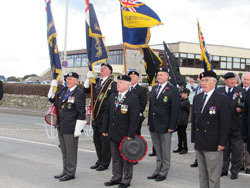 The following day Chard Branch members and some of the guests from the previous evening attended the annual Trafalgar church service at St Thomas’ Church, Cricket St Thomas, during which two Standards were paraded (Chard Branch and Redruth). Following the service those attending relocated to the nearby Cricket St Thomas Golf Club for refreshments prior to departing to their various destinations. At 2200 hours on Sunday 17th October 1948 in gale force winds and rain squalls, the Ship’s liberty boat, a 36ft open motor launch (called a Pinnace) left Weymouth Pier to return to the 29,000 tonne Aircraft Carrier, HMS Illustrious, which was moored within Portland Harbour. The liberty boat was carrying 50 men; a crew of 5 and 45 liberty men who had enjoyed a few hours relaxation in Weymouth. The boat headed out across Weymouth Bay, before passing through the northern entrance of the massive breakwater into Portland Harbour. Here, the state of the sea became much worse and immediately the liberty boat was in trouble. As it began to ship water the sailors on board began bailing out the Pinnace with their caps, buckets and anything which came to hand. Others attempted to keep the sea out by forming a breakwater with their bodies. Regrettably, all their efforts were in vain and the liberty boat foundered and sank some 50 metres astern of Illustrious. Rescue boats were immediately launched from ILLUSTRIOUS and other naval ships in the harbour. The Weymouth Lifeboat also joined the search. Searchlights were trained on the sea, ropes and buoys were thrown from the Ship’s side and men dived from the gangways to assist those trying to stay afloat. There was incredible bravery, strength, resolve, courage and character displayed that night. Despite all their brave efforts and that of the Weymouth Lifeboat, 29 of the 50 on board the liberty boat were list; their average age was 23. Some of these men are buried in the Naval Cemetery in Portland; others went to their home towns. Wherever they lie we will never forget them. 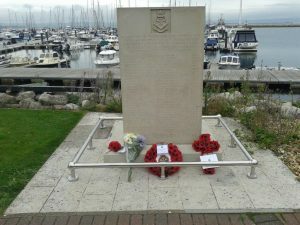 Exactly 62 years later on Sunday 17th October 2010, a beautiful Memorial made locally in Portland of Portland Stone, was unveiled by the First Sea Lord and Chief of Naval Staff, Admiral Sir Mark Stanhope GCB OBE ADC. This Memorial, to commemorate those lost in the tragedy, was provided by the efforts of HMS ILLUSTRIOUS Association through the generous donations of Association members and other interested persons. 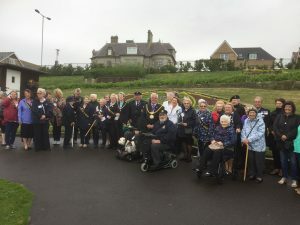 HM Lord Lieutenant of Dorset; senior Royal Naval Officers; relatives of those lost; four actual survivors of the Disaster; and members of the Association and the general public, attended the truly emotional and moving Unveiling Ceremony. Also present was a contingent of 29 sailors for the current HMS ILLUSTRIOUS, each representing a life lost. Those present watched the Royal Marines Band Beating Retreat, also a fly-past by a Seahawk and Swordfish of the Royal Naval Historic Flight. Additionally, two Royal Navy Lynx helicopters flew over the actual site of the sinking of the Liberty Boat and dropped a memorial wreath. 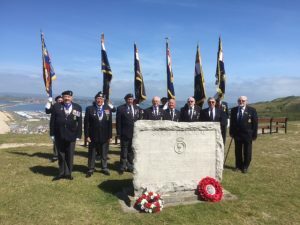 Each year since the Memorial Unveiling Ceremony in 2010, a service has been held at the Memorial on a Saturday as close to the Anniversary date as possible, to remember these brave sailors. In addition, we now also remember the founder and instigator of the Memorial, ex-Chairman of HMS ILLUSTRIOUS Association, John Ellis, who sadly died suddenly in November 2013. We also remember JACK CRANNY, local Historian, who died in 2016, who did so much to help John Ellis with the Memorial project. 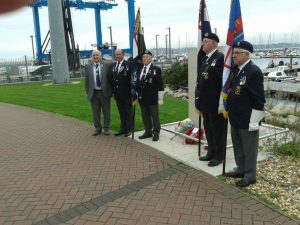 Royal Naval Association Portland Branch Chairman, Dan Sherren said that we would ensure members of our branch and other Associations would continue to support this ceremony each year in the memory of those lost Shipmates. Maureen Sherren RNA Portland Branch PRO. Conservative Club Easton on the Royal Manor of Portland. The meeting was opened by the Portland Town Deputy Mayor, Councillor Charlie Flack (a former CPOMA and now a Portland branch member) accompanied by his wife Maria. Councillor Flack gave an abridged version of the history of Portland and both he and Maria remained with us until completion. The standard was marched on by the Area standard bearer Ben Cartwright and Shipmate Chaplain the reverand Geoffrey Walsh offered prayers. It was encouraging to see so many branches attending – AXMINSTER, BRIDGWATER, BRIDPORT, CHARD, CHRISTCHURCH, DARTMOUTH, DORCHESTER, FALMOUTH, FERNDOWN, FROME, LAUNCESTON, LISKEARD, PLYMOUTH, SALTASH, SOUTH BRISTOL, TORBAY, TORPOINT & RAME PENINSULA, WEYMOUTH, PORTLAND. 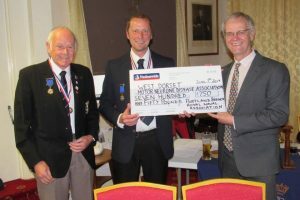 During the meeting our President David White presented a cheque for £2,300 to Mr Geoff Robertson on behalf of Scotty’s little Soldiers, a charity dedicated to supporting bereaved British Forces children. Geoff went to great lengths to enlighten us on the mission of the charity. A presentation by Mr Tim Corke of the Royal Navy and Royal Marines charity outlined the works of the RNRMC and how as branches and individuals we can contribute. More info is available at rnrmc.org.uk for those who dabble in the nether world of the internet! DNCM Shipmate Gutteridge read a report of proceedings from the National council. The President closed the meeting, but not before he had presented me with a £200 cheque for the Portland branch. We are more than happy to host again as and when required. Of the branches attending we were very pleased to have the following remain for the evening social – AXMINSTER, BRIDPORT, CHARD, DARTMOUTH, DORCHESTER, TORPOINT & RAME PENINSULA, WEYMOUTH, FALMOUTH. With almost 30 raffle prizes on offer I believe everyone had a fair chance of getting something to take home. The daytime raffle was a huge success with another 30 odd prizes not counting the rum raffle, which our social secretary won! Our branch has benefited greatly from this weekend’s activity both financially and from publicity in the local area with new members keen to join. For those branches who feel they are unable to host the area meetings please think about what it can do for you, we at Portland will always offer any help you may need in the way of organisation etc. Looking forward to Saltash for the next meeting. 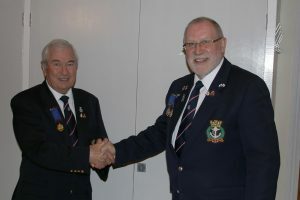 The Committee for Chard Branch Royal Naval Association announced, through the Branch Chairman and Standard Bearer Shipmate Malcolm Day, their intention to bestow upon their Vice President Shipmate Roy Lovell, the honour of becoming Branch President. Those members present at the September bi-monthly official meeting showed their agreement and pleasure of this intention. The honour was gratefully received by the surprised Roy who stated he was truly honoured and would endeavour to maintain the high standard that is expected of the role. The nomination of Roy as President, in this the 30th anniversary year of the Branch, is most worthy in light of the fact that Roy, a local born and bred member, was instrumental in initiating Chard Branch Royal Naval Association. 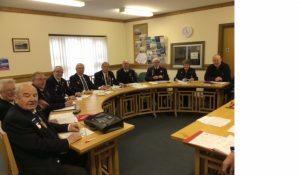 Roy along with other ex-Royal Naval locals talked about the instigating of a branch and due to Roy making the initial contact with RNA Headquarters, Portsmouth was put in the ‘hot seat’ after being ‘volunteered’ as Branch Secretary, a role he held for 27 years. On retiring from this post due to family commitments he was asked to take on the role of Vice President, which he accepted, and has resulted in his continual support of both the Branch and the Royal Naval Association for the past 30 years. The branch, as a result of his actions, was Commissioned on the 3rd of October 1987 and will be holding its 30th anniversary celebrations on Saturday 21st October, in conjunction with the Branch’s annual Trafalgar Night celebration to be held in The Shrubbery, Ilminster with members from across Area 4 Royal Naval Association attending to give support to this achievement. 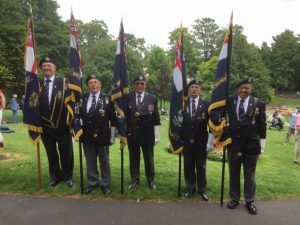 Following the evening celebrations at The Shrubbery Chard Royal Naval Association members and their guests will be attending the Branch’s annual Trafalgar Service in St Thomas’ Church, Cricket St Thomas at 10am on Sunday 22nd October. 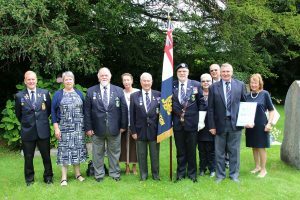 Every year on this occasion the Chard Branch Standard is paraded at the church service, and this year members of other Area 4 Branches attending the Trafalgar Night and 30th Anniversary celebrations will also be presenting and parading their standards. Shipmates attended two events even though they coincided with the Biennial Parade in London. The first was held at St Osmund’s Church Osmington and was attended by members of Portland, Dorchester and Weymouth Branches. This was to re-dedicate a WW1 Memorial Parchment, which had been discovered in the church tower. The parchment is unusual as it lists not only those who lost their lives but everyone from Osmington who served in The Great War. between the “AVALANCHE” bound for New Zealand and the “FORREST” bound for Canada off Portland Bill. So shocked were people in New Zealand that they launched an appeal for a Memorial to be erected on Portland. This raised £1000 and it was decided to use thethe money to build a church. A representative of the New Zealand High Commissioner also attended the service. During the service one of the candles which had also been salvaged from the wreck of the “AVALANCHE” was lit. We mustered at the Parish Church of St Mary the Virgin, Swanage. Sunday 13th August 2017. Eleven Standards representing a variety of organisations from all over the South and South West of England attended a Service to mark the centenary of the action on 8th August 1917 by Q-5 Dunraven, also known as HMS Farnborough and to honour the memory of Chief Petty Officer Ernest Pitcher VC, DSM, Medaille Militaire, Croix de Guerre. And those with whom he served. The standards were very well supported by attendance of family, friends and Shipmates from No. 4 Area of the RNA. 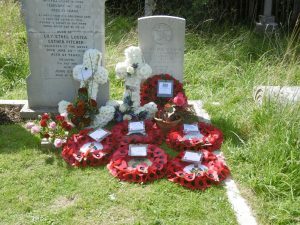 Following the service we moved across to Northbrook Cemetery to pay heart felt tributes at the grave sites of CPO Pitcher and other Naval ratings, one of which was that of a boy seaman, only 15 years of age. Also images from the grave of a 32 year old Stoker 1st class that Ben and Vaughan were at for the Last Post while I was at the 15 year old’s grave. A very worthwhile undertaking by everyone, especially so those that travelled all the way up from Cornwall. HMS QUEEN ELIZABETH will enter Portsmouth harbour at 0710 on 16th Aug 17. Owing to this short notice, it is with much regret that I have to inform you that the Fort Blockhouse event has now been cancelled for the Royal Naval Association members. On behalf of the Royal Navy, Capt Krosnar-Clarke and all the team my sincere apologies especially to thoise that have made arrangements. As originally explained in my last update it was originally envisaged that there would be no limit to ticket allocations for Fort Blockhouse. However, once the finer detail had been investigated it revealed that local traffic congestion and the infrastructure within F/Blockhouse plus large sections of the sea wall which had collapsed and become unusable, due to the consequent H & S issues, a decision was made to reduce attendance numbers to a level that could successfully managed by Fort Blockhouse staff. The QE first entry team have provided RNA Central Office with 450 tickets for Fort Blockhouse and 50 for the Naval Base, over 670 applications were received and regrettably some applicants will be unsuccessful with their application. I am currently in the process of obtaining addresses for the successful 500 and will arrange for the tickets to arrive with them by early next week. Please would you be kind enough to strongly highlight to your members that security is very tight and entry will be by numbered ticket only which corresponds to the list provided by RNA Central Office to the Security staff. Finally, please would you remind your membership not to turn up on the off chance of gaining entrance as this will only add to traffic congestion and they will still be denied entry. 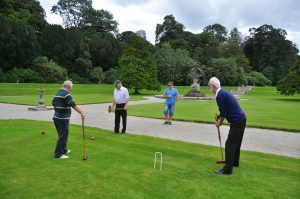 Royal Naval Association No 4 Area branches from Bodmin, Bude, Delabole, Launceston, Liskeard and St Austell mustered at Pencarrow House Cornwall the Home of the Molesworth-St. Aubyn Family on Sunday 6th of August for the annual croquet contest. The Chairman of No.4 Area Shipmate Ron Burdekin and Ann Weir the widow of Admiral Alec was pleased to see and chat to the 50 ish Shipmates who attended the afternoon which was organised by Delabole Branch. A super day out was enjoyed in the grounds of Pencarrow some partaking of the Cream Teas available in the cafe. With 11 teams competing for the Trophies there was some fierce competition. Lady Iona Molesworth- St Aubyn kindly agreed to present the trophies to the winners who were Liskeard Branch and to Bodmin who were runners up. Friday 21 July saw a grand turn out for the big 100 years of the WRNS at Greenhill gardens where the floral celebration was on show in the background. It was a very wet day but it did not dampen spirits local RNA and Merchant Navy associations were present and correct. Local MP Richard Drax and the Weymouth town mayor braved the torrential rain to support this very special event. S/M Maureen Sherran gathered Pat Hudson from her operation’s recovery and also braved the elements! Absolutely superb Sea Sunday parade on 16th July 2017 in Falmouth led by HM Band of the Royal Marines, FO Plymouth. The Chard Royal Naval Association members had a great day today when 17 attended the annual Mission to Sea Farers Sea Sunday Service at the local St Thomas Church on the Cricket St Thomas Estate. The church was well attended not only by the branch but members of the public from the hotel complex and, of course, those regular weekly attendees. 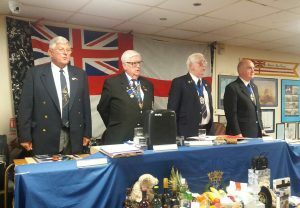 The service was carried out by the local vicar Canon Hugh Williams (ex Royal Navy) who held an excellent service in honour of ALL mariners throughout the world.Vice President Sm Roy lovell gave the reading on behalf of the association. On completion of the service members lined up for a photo with the standard paraded by Chairman and Standard Bearer Sm Malcolm Day. Once completed members made their way to the Cricket St Thomas Golf Club for tea and coffee whilst waiting for other members to attend for Sea Sunday lunch organised by Sm Helen Day, this swelling the number of attendees to 26 taking advantage of the golf club’s wonderful carvery lunch, with some following up with dessert. All in all the Branch enjoyed a lovely Sunday out with great shipmates, family and friends. Thank you to all who supported this well deserved cause. 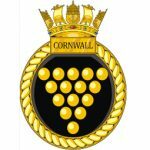 Our next event will be our annual Trafalgar Night Dinner which, this year, will incorporate the 30th Anniversary of the commissioning of Chard Branch RNA on Saturday October 21st at the Shrubbery, Ilminster followed by the annual Trafalgar church service on the Sunday at Cricket St Thomas Church. 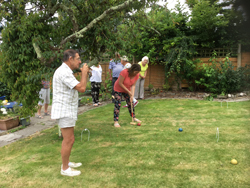 A great time had by all at the Frost place, and a few games of croquet were played. This seemed a good idea, as a practice before engaging in the Admiral Alec Weir Memorial croquet tournament being held at Pencarrow House on Sunday the 6th of August. 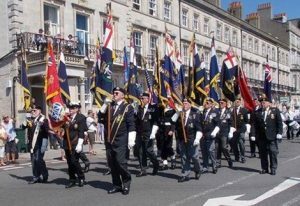 Dorchester armed forces day Saturday 1st July was well attended on a very nice day. Standards from the local area were marched on led by the No. 4 Area standard with our very own Ben Cartwright. 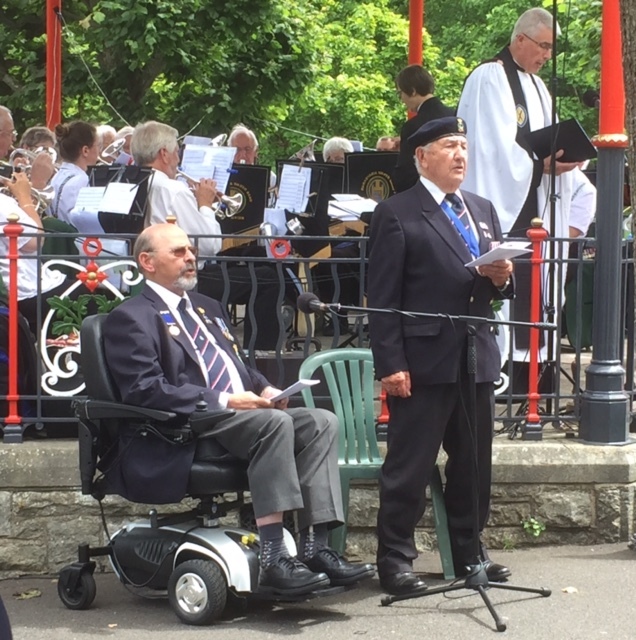 The service in the park was delivered with the theme being the armed forces. On completion it was up spirits which reminded me of one of the reasons why I do these things! 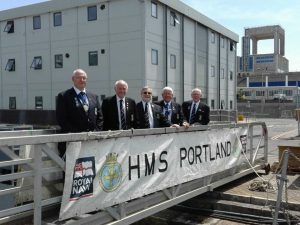 Friday the 16th June saw seven members of Chard branch Royal Naval Association travel to Avonmouth Docks for a visit aboard their affiliated Royal Naval ship, HMS Somerset. They were quests of the Captain, Commander Tim Berry and his most welcoming crew. The party of seven were greeted on board by various members of the crew and after a welcoming and refreshing drink, due to it being, a balmy night. Afterwards they were then shown around the vessel stopping off at the bridge for a demonstration of a simulated attack from an unknown force carried by the officer of the watch and men on watch on the bridge. This then followed by a tour of the operations room where the crew were closed up in high alertness searching for the possibility of attack by unknown forces from sea and air, this was a well honed demonstration and very enlightening. On resuming, on the flight deck, the party mixed with the various organisations that had also been invited to attend and it was great to see s many ‘local’ people on board especially for the shipmates from Chard and Ilminster as Commander Berry’s parents were guests and are still resident in Coombe St Nicholas where Tim was brought up and went to primary school followed by Holyrood Academy. He played County school boy level rugby and cricket when at the academy. It is fair to say that at the time of the visit there were more people aboard from Chard and Ilminster that evening than from anywhere else. Before leaving to return home the party were privileged to observe the Naval tradition of ‘Sunset’ ( the striking down of the Ensign and Union Flag) and witnessed the marching on of the guard just prior to the event. 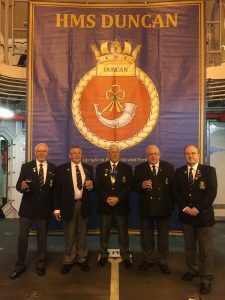 This brought many a memory for the former matelots and brought the evening to a close only to leave time for a photograph on deck of all naval and former naval personnel from the Chard and Ilminster areas of Somerset. Cartwright were paraded along the seafront with much applaud from the huge crowds. The five bands attending were magnificent helping to keep everyone in step for the long march to the Pavilion in brilliant sunshine. Shipmates, Saturday night out on Portland for members of the Portland and Dorchester branches when we visited HMS Duncan the latest of the type 45 destroyers to enter the Fleet. From the meet and greet and delivery to the ship in good order it was obvious that the ship’s team were well drilled and enthusiastic. The Commanding Officer, Commander Eleanor Stack Royal Navy introduced her ship and it’s company in a very well delivered speech. HMS Duncan has already completed a very busy schedule and now prepares to deploy for another three months as part of a NATO force to the Northern waters. HMS Duncan will play an important role in escorting the UK’s new Aircraft Carriers, the two biggest ships ever built for the Royal Navy. What is a Reception and Capability Demonstration RCD? People often ask what a Reception and Capability Demonstration is so here is a short explanation. Warships spend almost all their time either deployed on operations, training for them or undertaking the regular maintenance essential to keep such complex machines finely tuned. On a few occasions each year, however, they have the opportunity to visit non naval ports in the UK. This is not just for rest and recreation, though that is an important element, but to allow what we call “regional engagement” to take place. It is a fact that 95% of all our imports come by sea and this includes oil and natural gas; yet how our trade routes and energy supplies are protected is hardly known by the public. These ship visits are designed to engage with all elements of the community to increase awareness and understanding of the maritime domain and thus reduce this so called “sea blindness”. 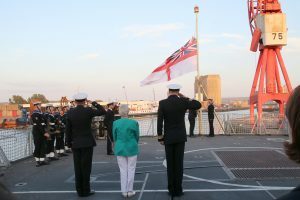 During the visit the ship will undertake a number of tasks normally including being open to visit by members of the general public, hosting organised tours from educational establishments and youth groups, offering potential recruits tailored visits and, at the heart of the visit, the Reception and Capability Demonstration. An extremely interesting and entertaining evening for the numerous guests who gathered at the hangar for a ceremonial sunset to end proceedings and signal our time to say farewell. Here we have six of our Branch Members, including Our Chairman Sm Malcolm Day, Secretary Sm Gary Pennells and Treasurer Sm Mike Kirland along with Sm John Cope, Sm Liz Cable and Sm James Kirkland (not in picture but taking he image) , waiting for a boat to pick them up from the jetty in Torquay. Our adopted ship, HMS Somerset, is in the distance, over John’s left shoulder. 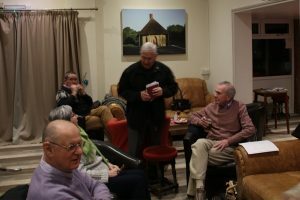 The group were invited to an RCD (Cocktail Party in old money!) onboard the ship on 2nd June. At the close of the party, a sunset ceremony was held, which was an emotional moment for our members, bringing back many memories. The Branch would like to thank the CO, Cdr Tim Berry, and everyone onboard, for the invitation and for treating us as VIPs during the visit. Another group from the Branch will be joining the ship next week in Avonmouth, for a similar event. 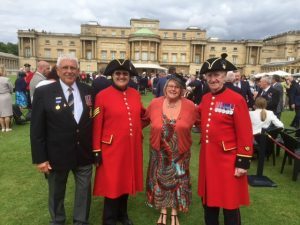 The Not Forgotten Association Garden Party was held at Buckingham Palace Tuesday 30th May 2017. The security organisation for this event was excellent, as it had to be bearing in mind the tragic occasion in Manchester of the week before. My wife Maureen and I joined over 2000 former and serving members of the armed forces on a fair weather day with just a threat of rain which luckily did not materialise. The meet and greet team were at their best, full of energy and polite humour which made us feel so welcome. Hard to say who exactly were there from our area but the ones we did manage to bump into were having a very good day out in the capital’s premier garden. The Christchurch team led by Christine Payne, the Area ” Sin Bosun” Geoffrey Walsh and his wife plus of course George and Dennis from Dorchester who were excellent company throughout. We know there were others present on the day but as I said we did not get to see them, even though we were strategically situated on the beaten track to the heads! Her Majesty the Queen was not in attendance but her absence was made up in good measure by His Royal Highness Prince Henry of Wales KCVO (Harry) who kept his security team on their toes, wanting to stop talk to everyone he came across during his walkabout. Music was provided by the Band of the Corps of the Royal Engineers under the direction of Captain Oliver Jeans Corps of Army Music who also performed a beating of the retreat. Pipe music was played by Pipe Major Duffy Scots Guards Association and Lance Corporal Spence Irish Guards. An excellent tea was served followed by lashings of strawberries and cream, the caterers had obviously done all this before and we made a point of thanking the Management team of the company, Ampersand who seemed a little taken aback, not being used to being thanked! His Royal Highness departed around 1700 and we boarded our coach to return to the Union Jack Club dropping off the Chelsea Pensioners en-route. We were treated to being one of the first organisations to hold a meeting at this old but very comfortable Club. The staff were excellent and made sure the proceedings ran without a hitch. We can only wish them well for the future. Even though the deck head was rather low our area Standard bearer found a way to conduct his drills splendidly. The good service was much appreciated, so much so that the Club Stewardess was presented with a RNA No. 4 area pennant by the President. She did however lose some new found friends when she won the rum raffle! in part made up for it by going to all the trouble of baking a cake to welcome us to her club. The Mick and Mary Hannen Cup 2016 results were as follows: Brixham + 10 Plymouth + 8 Liskeard + 6. As the winning branch were absent the Chairman offered to deliver the trophy enroute home. Saltash will host the No. 4 area AGM, the event will be held on the 20th January 2018. Vice Chairman Peter Shoesmith presented the Jaqui Ward trophy certificate to this years winner Helen Day. Date for your diaries if you can make it to Swanage in August. The Royal Marine Association have invited “Jack” to a memorial service at Saint Mary church, 13th August at 1450. Ben will be parading the Area standard and any others would be most welcome. The service is to celebrate 100 years since the death of CPO Pilcher who served in both world wars, being awarded the Victoria Cross and other decorations. 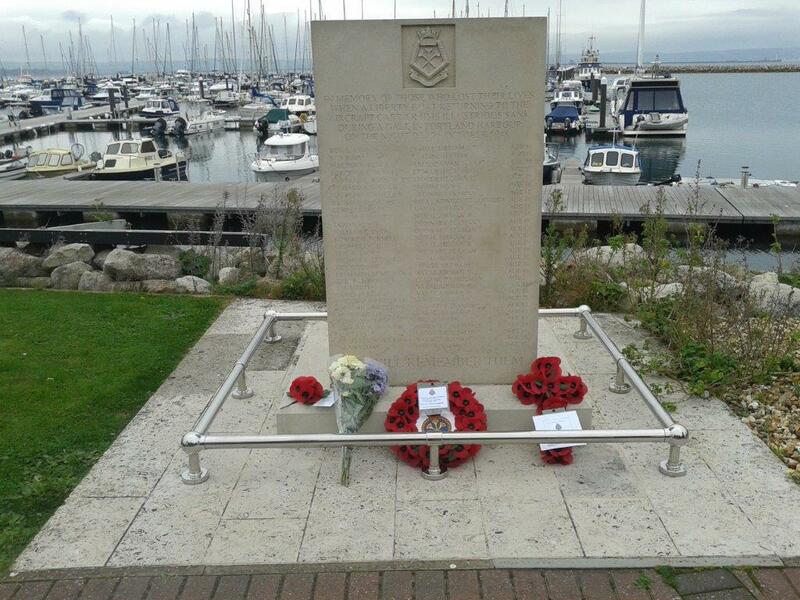 There are a number of other Naval graves at which we will also pay our respects. Image 3168 Commander Berry presents Chard RNA Chairman s/m Malcolm Day with print and skip’s plaque. Present day Royal Navy personnel met up with veterans and associate members of the Chard Branch Royal Naval Association at an affiliation dinner held at the Lordleaze Hotel on Tuesday 14th March 2017. 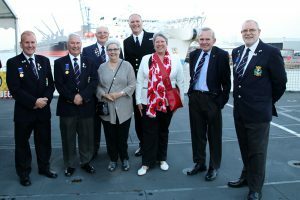 Chard Branch joined in an affiliation with the appropriately named Royal Naval vessel HMS Somerset starting a friendship bridging the gap of old and new. The Commanding Officer of HMS Somerset, Commander Tim Berry RN, was born and bred in Chard and was educated at Combe St Nicholas Primary School and Holyrood Secondary School prior to attending the Richard Huish College, Taunton and also played Rugby and Cricket for Chard. His parents still live at Combe St Nicholas so is a frequent visitor to the area. Also attending the celebration dinner of affiliation was the Executive Officer of HMS Somerset, Lieutenant Commander Vince Owen RN who also lives fairly locally at West Coker. The Chard members enjoyed an introductory speech by Cmdr Berry highlighting the changes from the current day to past ships of the Royal Navy and the changes in crew with 33 members of his crew being female, emphasising the valuable input these females make within the ships company. Chard Branch received a print of HMS Somerset together with a ship’s plaque and an exchange of gifts was given to HMS Somerset of 3 framed photographs of iconic buildings within Chard (Guidlhall, The Toll House and Chard School) together with an RNA Flag which can be flown on HMS Somerset at appropriate times alongside their ship’s ensign. 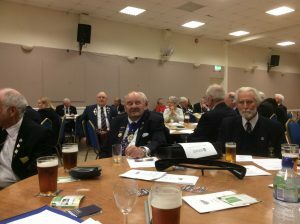 It was made clear during the evening’s events that this was the start of a friendship that will grow and all looked forward to meeting up again when day visits can be made for Chard members to visit the ship. An open invitation was also given to all members of HMS Somerset who wished to attend our forthcoming meetings or social events. Chard Branch is extremely proud to have this friendship, but even more proud to have two ‘local lads’ who have both achieved in the Royal Navy. It is a real honour to have both our patron (Commodore David Pond RN) and the current Commander of HMS Somerset associated with its Branch; both having grown up and received their education in Chard and both having played rugby for Chard. Following an invitation from the Frome branch of the Royal Naval Association, Maureen and I attended the 2017 annual concert performed by the band of Her Majesty’s Royal Marines. Returning for their 22nd concert in support of the Frome branch fund raising event for a variety of local charities. It should be noted that the Royal Marines from Lympstone all volunteer for this event which comes on the heels of “in the mud” and other training. One very good reason for their return every year is the splendid way in which they are treated by Frome branch RNA. The evening was a great success, the Memorial Theatre was packed with a very enthusiastic audience who were not backward in coming forward in response to the Bandmaster’s spirited engagement, it was nice to see the local sea cadets getting involved in the proceedings, conducting ceremonial sunset duties. Following the concert we were invited backstage to meet the branch and the band, another nice touch by these hard working branch members making it a night to remember. The good news is, it is happening again next year so mark your diaries for Frome in March. During the week of the 14th – 21st February 1942 an advertisement appeared in the Somerset Standard announcing the adoption by Frome of the submarine HMS Thunderbolt and the target of raising £175,000, (£7m by today’s standards), by the people of Frome as part of the war effort. Later it was announced in the same paper that the NOIC Avonmouth Vice Admiral Sir Robert Hornell KBE DSO would be attending a ceremony on the 12th March 1943 in the Grand Cinema Frome, now the Memorial Theatre. He was to receive from the Chairman of the Frome War Savings Committee the badge of HMS Thunderbolt on behalf of the Commanding Officer of the submarine. Unfortunately HMS Thunderbolt never received the gift as she was lost on the 14th March 1943 off Sicily, the badge was not lost and now forms part of the Memorial wall in the foyer of the theatre. In 1994 Shipmate Ken Ring decided that a commemorative event should take place to remind the people of Frome of the sacrifice made by the crew; Ken decided a concert by the Royal Marines Band would foot the bill and the rest is history. The first concert was held in March 1995 as a one off however this year’s was the 22nd consecutive concert. 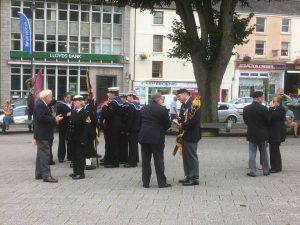 During that period the money raised has supported the theatre, which is completely operated and maintained by volunteers many of them members of the Frome RNA, purchasing boats and equipment for TS Achilles sea cadets based in Trowbridge as well as many service charities, individuals and organisations such as the RNLI. Over the weekend 3-6 March 2017 more than 200 members attended the 42nd Area Reunion Rally, and the 13th at the Durrant House Hotel in Bideford (with an E). Our area covers some 10,000 square miles and most of us travel a fair distance to get to Bideford, so well done in supporting those who work very hard on our behalf throughout the year. Thus ensuring we remain one of the more dynamic areas in the RNA. On the subject of attendance we should pay tribute to a Portland couple who have attended 41 of the 42 rallies held, they are Dot and Tony Elliott, they hope they might win a raffle prize next year! Bravo Zulu. Once again the hotel Management and staff pulled out all the stops to ensure our 13th visit was again most memorable. So much so that the Hotel owner Parm Bahia and Head Chef Richard Copp were both awarded associate membership to No. 4 Area for services rendered. The tried and tested format for the weekend events were once again put to the test and proved sound, ensuring everyone had a most enjoyable time, the organisers and committee should be congratulated for a great result. In the absence of our President David White, Charles H Thompson took charge and proved that he has not lost his presenting skills honed over many many years. The acceptance by the Chaplain of the fleet the venerable Ian Wheatley CB. QHC RN, accompanied by his good lady wife Deborah to be our Guests of honour, proved to be an excellent move. Resulting in one of the better speakers we have had for many a year, his background knowledge of the lower deck and wardroom humour stood him in good stead to deliver his message in a very unique way for us all to enjoy. Can we have him back please! Chairman’s Concert Report: This year the bar was raised very high with contributions from some very skillful and enjoyable acts who kept us fully entertained. Of note – Tug Wilson must have misplaced his compering suit this year as he conducted the Concert in his patriotic underwear! even after all these years he can still hold an audience, thanks Tug. Best individual – Rose bowl – Malcolm Day. Overall winner – Charles H cup – Axminster Branch. The church service this year was once again very well attended, eleven standards were paraded and Ben Cartwright had his first proud outing as our Area standard bearer. The large church service attendance collection of around £240 went a long way to boost the overall takings from the weekend to nearly £2000. Well done to the hard working ladies who continue to extract our hard earned cash from us and also the raffle draw team who persevere, no matter what. The No4 Area Open and Closed Standard Bearers Competitions took place on Sunday 26th February 2017 at the Sea Cadet Headquarters in Bridgewater. 5 competitors took part and after the usual ‘hand in the pot’ selection the running order was: Mike Lawton, Frome; Mike Morton, Bridgewater; Dennis Matthews, Dorchester; Ben Cartwright, Portland and Lynwood Newman, Weymouth. After the judges, Charles H Thompson, Jim Patterson and Tony Seal, and the adjudicator had taken their places the Area Ceremonial Officer, Malcom Day, marched on the competitors and addressed the assembly giving thanks to all who attended. The competitors were inspected on their standard of dress, equipment, bearing, and the cleanliness and condition of their Standard. On completion the competitors were marched off and after a short ‘stand-easy’ the drill section took place where they were marked on their deportment, control of the Standard and drill movements. It was encouraging to see some new faces there. Mike Lawton from Frome, having attended the Sunday training sessions, and Lynwood Newman who ‘came in out of the cold’ having had some local training from Tony Seal. 5th place Lynwood Newman Weymouth. 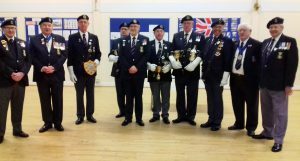 The trophies were presented by the Area Chairman, Ron Burdekin who thanked all the competitors, judges and officials and Bridgwater Sea Cadets for allowing us to use the hall. After a superb ‘bun fight’ laid-on by the ladies, a raffle was held with the proceeds being donated to Bridgewater Sea Cadets. Thanks to Ben Cartwright for sending this comprehensive report through. As I was absent due to family commitments. 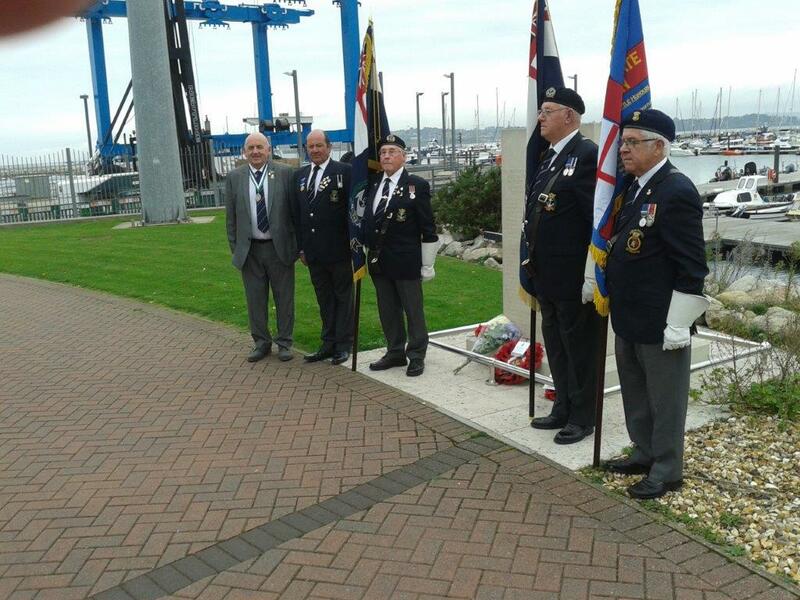 Following a Royal Navy request for RNA assistance, Standards and Veterans attended the South African Navy, SS Mendi 100 years Remembrance Ceremony at the Pyramid’s Centre on Southsea sea front on Friday 17 February 2017. Weymouth pulled out all the stops to ensure the day was prepared in a very well appointed venue, shame about the heating system but the hot air from the floor went some way to compensate. A big thank you must go to the ladies in the galley and we should not forget the barmaids in the beer hatch! 20 branches turned out, some of them travelling a fair old distance, well done. 10 apologies were received and sadly 4 branches did not bother to respond to our secretaries calling notice. Shipmates, just one year ago when I started as your Area Public Relations Officer I offered my assistance and experience to any branch who were interested in reaping the rewards of having a Royal Naval partner to interact with and develop friendships throughout the life-time of the chosen vessel. Having attended the commissioning of HMS Portland and continued full liaison through the years my branch has enjoyed the company of the crew, joining them for days at sea and attending other ship visit invitations. We have also been very fortunate to engage on a more formal basis by having the Commanding Officers as guests of honour at our annual dinners. The success this year in engaging the Chard branch with HMS Somerset has been most fulfilling for me as it took a deal of patience and effort. Thanks must go to the ships team of HMS Portland and the guys at HMS Flying Fox, who supported my endeavours and achieve a great outcome. I am Hon Secretary of Chard Branch of the RNA. I can see from the emails below, that Dan Sherren, Area Public Relations Officer, has done some work on this affiliation and we are grateful for his help and your support for this project. 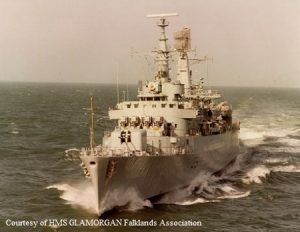 I am pleased to let you know that the possibility of an affiliation with HMS Somerset has been enthusiastically received within Chard Branch and we are all keen to see this go ahead, as soon as possible. We are intrigued to know that your CO was at school in Chard and has connections with the town. Coincidentally, we are about to move our meeting venue to Chard Rugby Club…..it seems that our affiliation is written in the stars! 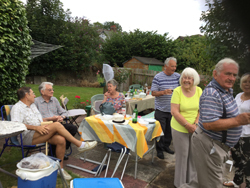 Chard RNA Branch is an active Branch, with all meetings well supported and a full social calendar throughout the year. 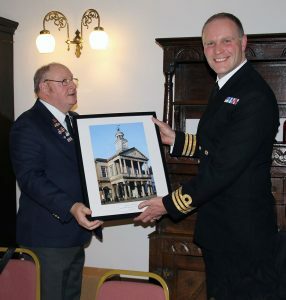 Our Branch Patron is Cmdr David Pond, another “local lad” with strong sporting connections, particularly RN Rugby. We will look forward to hearing from you, and to meeting everyone on HMS Somerset in the not-too-distant future. I’m very interested, partly because I went to School in Chard (Holyrood), as well as playing cricket and rugby for the town whilst at school, college and Uni. I think an associate member is the right level and I’m happy to call on them at some stage as my parents are only 2 miles from Chard and I often visit on the way back up the line. Pse touch base and see what we can organise as well as nominating an officer to support.As my job is done I will now stand back and let them get on with establishing the relationship. I will of course remain available to help wherever I can. Maureen, myself accompanied by Dennis and George from Dorchester arrived at the Mercure Southgate hotel, Exeter in time for a cup of coffee and the Champagne reception. It was soon evident that there were a lot of guests attending which was very satisfying for the organisation. We were escorted to the Seymour Suite where up to 100 guests were to be seated for what turned out to be a very good Christmas lunch. From the very start we were entertained by Rosie Thompson and her multi talented team Annie Riley and Le’arna Castle who made sure this was an afternoon to remember. Ilford Park Polish Homes, Merchant Navy, RAF Association, REME, RNA No.4 Area, Royal Marines, Royal Signals Association, Somerset Legion House, WRAC Association, Aden Veterans, Algerines Association, Association of WRENS, Blind Veterans UK, Federation of Merchant Mariners, HMS Newfoundland Association. You can imagine the level of competition throughout proceedings – airborne battles with balloon missiles, hard won competition between individuals for the King and Queen winner title and even more robustly during the 12 days of Christmas challenge! We were also energetically joined by representatives of JTI , the company who has supported the NFA throughout the year raising many thousands of pounds. A great day and one many of those attending will not forget as new friends and acquaintances were formed. Rosie and I spoke about the Armed Forces Day at Trowbridge and the “Bless Them All” concert this year and we agreed that an outdoor venue for the concert would be a much better idea. Maureen and I will be going again, if invited. 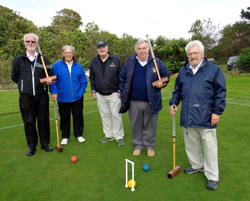 This years croquet match now named the “Admiral Alec memorial croquet match” was hosted by St Austell at the Cornwall Croquet Club at Porthpean.